Someone needs to. I’m not trying to scare you off, but you need to realize that work will be a big part of your life moving forward. You’re probably also wondering why I’ve stuck around in the industry for over 10 years? Back in 2009, after a year of banner ads and microsites for Bank of America, I was pretty sick of design and advertising. After 6 years of it, I came to the conclusion after averaging more than 1 job a year, it wasn’t for lack of variety. I actually started applying to nursing schools, and going on interviews, and doing volunteer work as prep and a reality check. And while I came to the conclusion that I could do it without a problem, and the schoolwork certainly wouldn’t be any worse than what I had here at TCNJ, it wasn’t want I wanted. And I realized I’d probably be just as miserable. Here I was, hitting the year mark at a job, again, and bored, unhappy, and it looked like if I wanted to get promoted, I’d have to find another job. Of course, the economy was tanking at the time so I figured I’d stay put. It got to the point where we spent several months planning an escape. Nursing school was an option. What if we sold our house and moved across the country? What if we moved to NYC so I’d at least have a shorter commute? What if we moved somewhere warmer? What if we took a vacation? I was actually hanging out at a friend’s house in rural Mexico, about an hour north of Cabo San Lucas when my wife and I figured it out. We had spent the week hanging out, doing some martial arts training, sightseeing, and swimming, and generally enjoying a completely disconnected life. When I say “disconnected” I mean – he had internet access, sort of, but we didn’t use it. We bought fish at the fishing beach and other food from the farmers’ markets. We slept on his roof in a mango grove. We were woken up at 5AM every damned morning by a rooster . We walked on a beach where a busy day involved seeing 2 cows and a bull. And we were happy. We actually talked about dropping out entirely and buying land there. But my Spanish was rusty, and by the end of the week, we realized we’d get bored. And we started having that stupid discussion about how “if money wasn’t an object, what would you do?” I still think it’s a stupid discussion. The world needs janitors and ditch diggers, and frankly, I don’t think many people do that for love. But after a few days of talking in circles, I realized: I did like design, and I liked making things. I didn’t care what they particularly were, but I wanted to make things that were useful. For example, a few years back, I worked on a credit planner for Discover Card. It wasn’t exciting. In fact, it was incredibly tedious. But it was powerful, and useful – and Discover Card was willing to open up a lot of data to the app, and this was well before “openness” was a thing. And I loved the fact that this it solved a very real problem (that it was really hard to figure out how your finances would be affected by a large purchase). That’s why I was happy doing “boring” work for a credit card company, but unhappy whenever I was doing advertising-related stuff, even when the clients were “cool”. I was happy working on the 2-year-long project that was renovating the 2nd floor of my house, even when I was inhaling drywall dust (or worse) all weekend. 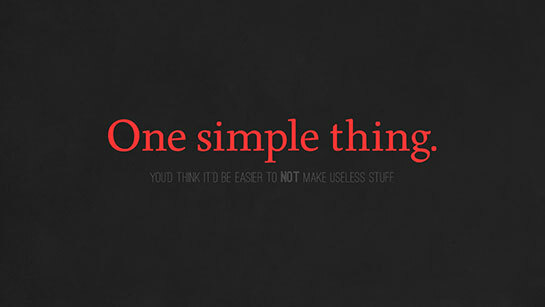 I realized that the problem was that I didn’t like doing useless crap. So, I got back to NYC, stewed, and then grabbed my boss and said that I wanted to do different things. I didn’t quit. I didn’t hand down an ultimatum. I just said that I wanted something other than banner ads, and wasn’t sure what I had to do to prove that I could do it. Turns out, speaking up can work! I had the opportunity to work on a couple pitches, and eventually moved full-time onto another account where I did, yes, banner ads and marketing stuff, but also a Facebook app that helped get dogs adopted. And I got promoted, which helped too. Eventually it wore off, and I made a couple good decisions and a bad decision which worked out anyway, but keeping my goal of “making something useful” has helped keep things a little more even. Now, even if it’s just something for my woodworking hobby/side business or a random design project. 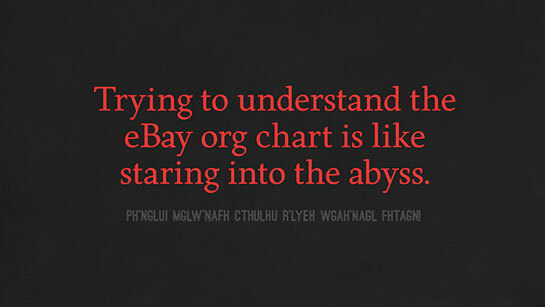 That’s pretty much the reason I took my current job at eBay. Helping millions of people around the world find what they’re looking for, when they’re looking for some oddball, obscure item? That’s cool! Being responsible for how 4-5% (depending on the country and the day) of eBay’s revenue looks and works? That’s exciting. That’s work with an actual impact. On the other hand, if I explain to you that my role is a hybrid design/developer/product manager/scrum leader, and I work to incorporate data-driven design in our process for the visualization of algorithmic merchandising, it probably sounds way less interesting. I’d probably start to nod off myself. My first job, I actually fell into the web design role. I was a freelance designer for RCN, but I picked up the design tasks when they fired their web agency. I did a lot of static comps and HTML/CSS mockups, etc, for delivery to developers. At my next job, I did a lot of web-based promotion design and some Flash dev. Then I took a web designer/webmaster role, and I learned a very important lesson. There is no such thing as a webmaster any more, for a very good reason. Any site with any degree of complexity is too much for a single person to handle all design, dev, content, and maintenance tasks. I then spent more time in the agency world, first focusing on marketing sites (and learning many lessons about the flash dev) and then doing a mix of marketing and commerce-focused design for credit card companies. I changed companies a couple times, and ended up working at Organic, where I did banner ads, microsites and a Surface table for Bank of America, and marketing and brand work for Iams, Eukanuba, and Pur, and did conceptual work for Unilever and P&G for mobile and tablet apps, and contributed work for winning pitches for the BBC and The Hartford Insurance Co. Then I did work for a hotel in Miami with wayfinding needs and worked on a 3D TV interface for Panasonic, and a Magic Mirror for MAC Cosmetics, all of which I found intresting when I was able to ask and answer two simple questions: What is a problem I can solve? Can I make this enjoyable? Not every project will have an answer to those two questions. Those BofA banner ads certainly weren’t helping anyone. That’s probably why I hated doing them. You could call that design thinking, if you like. 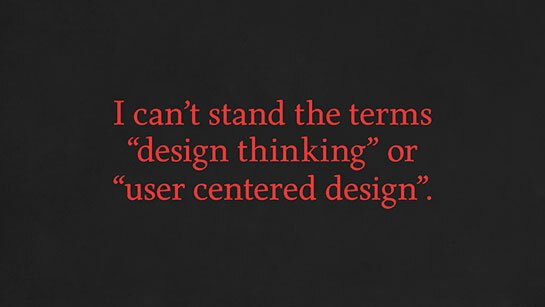 Or user centered design. I consider that MBA-speak. I hate those terms. I think they’re terrible. I think it implies that we as designers don’t think about the holistic user experience all of the time, or that we’re ok with making joyless-but-pretty things for people to play with. Some designers do, I’m sure. But they’re terrible designers. Don’t be a terrible designer. 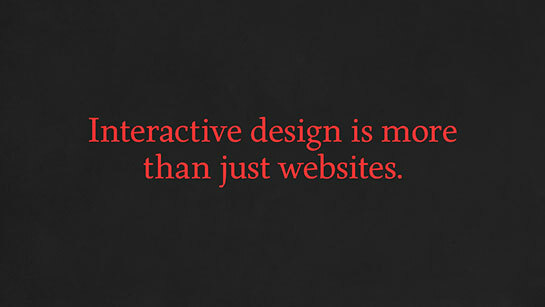 Being a good designer and answering those questions, makes you more than an interactive designer. Let’s take the example of an HDTV. Personally, I don’t find 3D that cool. It mostly gives me a headache and TV interfaces themselves are pretty lame. 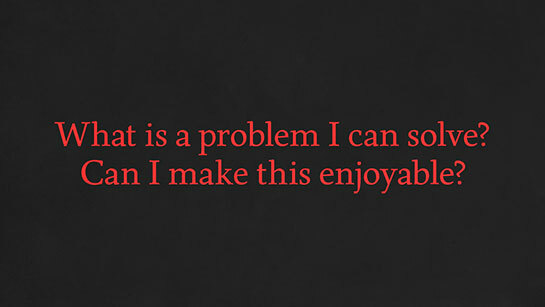 That’s problem 1 to solve. But there is another problem to solve here: Whether you’re using polarized lenses, or active shutter glasses, or -any- other 3D technology, when you mix 2D and 3D content, your brain breaks the illusion. In my case, it hurts to look at it. There’s a third problem: How do you make it easy to share content between a smart phone, smart tv, smart camera, tablet, pc, etc? There are very real technical problems to solve, and the traditional way consumer electronic companies traditionally approach something like this is to treat it like a technical problem add even more buttons to the remote. But as an interactive designer, you are thinking about information hierarchy, and the low performance of embedded systems, and how text display needs to change in 3D, from 15 feet away, and how to make the app experience actually enjoyable to use for a non-technical user. As Apple used to say, it’s about mixing art and science. The other great thing about this sort of outlook (what is a problem I can solve and how can I make someone’s life better) is that it lets you move beyond banner ads and marketing websites. I did not learn to design for TVs or tablets at TCNJ. I never actually tok a web design class. I learned about principle of design, and I got a chance to apply what I was learning in other classes to design (and vice versa). It’s more about being a full product designer and thinking about holistic systems and how people interact with people, how people interact with technology, and how technology interacts with technology. But that’s really complicated to say, so I just say “product designer.” My products just happen to be mostly digital. But again, it’s about more than making a pretty website. The mobile app landscape completely changed when the iPhone was introduced. Then tablets became mainstream. The line between website and web app had blurred, focused, and blurred again. We’re changing how we can create and consume content. Things like the Oculus Rift are changing gaming. The PS4 and XBox One are changing what game consoles do. Indie games are changing what games are. Nest is changing how people think of their thermostats and smoke detectors. Wearable technology might be the next big thing. Right now, companies are designing new medical equipment. And all of this is new – all of it is interactive, and I’d encourage all of you to explore the possibilities. And the great thing about a lot of these interactive experiences is that you can iterate, quickly. Not that you should push changes at random (see: my previous comment about no such thing as beta), but you can tweak interfaces. You can track clicks and eyes and behavior. You have tools at hand to make things better. You don’t have to test 41(!) shades of blue like Google did years ago, but you can find out if users prefer more items with smaller images or fewer items with bigger images, or if they scroll horizontally, or if button style 1 gets more clicks than button style 2. So, as a designer, you’re looking at all of these things and trying to provide answers. It’s actually a little overwhelming. Fortunately, you won’t be working on this alone in most cases. In almost all cases, there should be a team supporting you (if there isn’t, and it’s not your job to grow the team, that’s a warning flag). At eBay, the Merch team is divided into front-end (display, api, etc), back-end (data and algo), teams for each page type, vertical categories like motors and fashion, the global header team, registration, site speed, social… everything.) Even the home page has 3-4 different teams that own components. And there are design systems groups that go across pages and organizations. 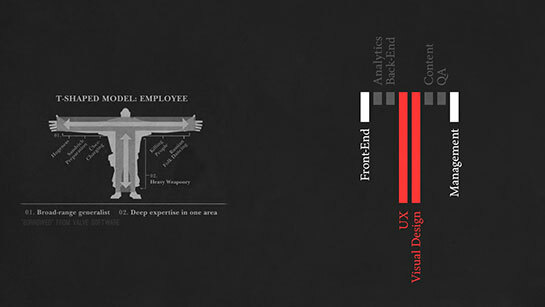 Each product team has its own designer(s), developers, and managers. There are server & ops groups, database people, content creators, info architects, people managers, product managers, general managers… it’s madness. I lose at least one day per week towards trying to find someone who is accountable for a feature that I need. But even though most projects aren’t to the scale of eBay, most digital products are built by teams nowadays. A portfolio site, or small business or vanity site can still be done by one person. Maybe you’ll need 2, if it’s being hooked up to WordPress or some similar CMS (though I recommend trying it yourself on a non-critical project). iOS apps… yes, there are the oddball apps where the whole thing is made by one person. That’s pretty damn rare, though. If the app is any good, that person is a genius, and I am jealous of them and I hate them. Anything bigger though, professionally speaking, is being developed by a team. You can segment out the skill set according to some basic lines. Strategy does research on competitors, possible features, user behavior, trends, etc. You can’t reasonably expect anyone to actually do all of these things (well). Even with my multiple responsibilities, there is plenty more that I mostly ignore. It’s best to think about it like a “T”. You have a deep knowledge in 1 or 2 subjects, and a general curiosity and a little knowledge about a lot of things. Valve (the video game people) do a great chart of this in their employee handbook. They use the example of the Heavy from TF2 as a metaphor for their employees (who should be generally interested in the business and process of making video games, but have their specialty in AI, or character design, or planning, or writing, or motion capture, or whatever. 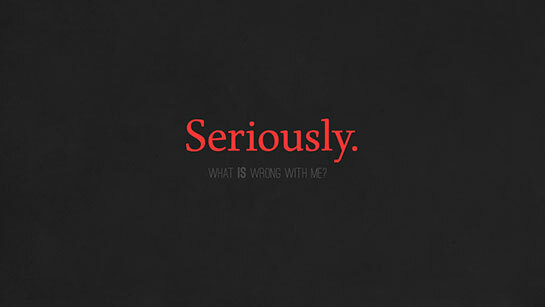 It make a nice sans-serif T. Same for interactive designers. You can’t be an expert at everything. If I had to make my own T chart, I’d have visual design and user experience be the deepest part of the T. I’m pretty shallow in content, data, analytics, back-end dev, and QA. I try to know just enough to not embarrass myself. Front-end dev, Process and people management? Somewhere in the middle. In my case the T is more of a W. Or maybe a serif-T. But that’s ok. The point is to develop a professional sense of curiosity, but know where your strengths lie. But this is big, and takes time to figure out, and it does take a bit away from the joy of seeing something that is purely YOURS come to life… This is where I recommend, with no reservation, making you you always have side projects going. I admit, I am terrible at this. 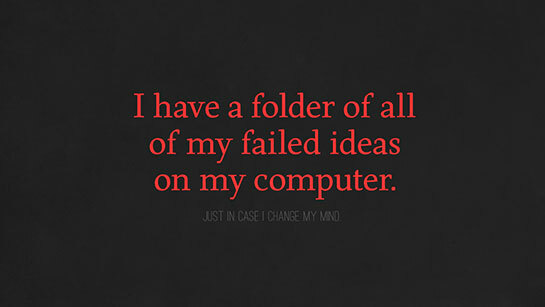 I have multiple abandoned side projects. Some too big. Some too involved. Some not big enough. But, it’s worth trying. I don’t regret trying to start a cooking website. It was all about “cooking for nerds” but then I realized that the concept I had just wasn’t interesting to others, and I once I listed out the content I had, I was going to have a tough time creating more because I wasn’t interested. I’ve killed, started, and resurrected my blog half a dozen times. I’ve tried making comics to retrain my illustration skills. I was doing a series of book covers (based on whatever book I was reading on the train at the time). Turns out I write at a snail’s pace, and often the last thing I want to do when I get home is spend more time in front of my computer. But that’s OK. One of the cliches of the dotcom economy (both the first time and this time) is to fail fast. It sounds stupid, but it’s not a bad idea. If something doesn’t work, stop doing it, learn your lessons, rebuild, and do something else. I still want to find a project that gets me drawing again (illustrate an existing story or do a sketch-a-day blog of some sort). I want to design a game at some point. I may restart my blog as “the daily something” in that I want to get back to making on shorter timelines, so I figure having to finish one project a day – even if it’s just a sketch – is a reasonable goal. The only one I’ve really stuck with is woodworking. 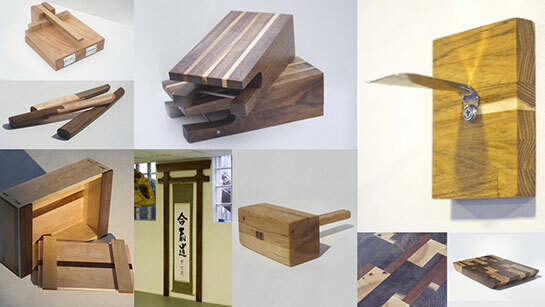 I have a small side business making “stuff.” Mostly martial arts gear for japanese martial arts (so wooden training weapons, sword racks, and some dojo niceties, but I’ve built some other random things, including an large torii for a dojo in DC. It doesn’t hurt that it pays me and doesn’t involve computers. Plus I get to play with logo design and experiment with web design techniques, and do business cards and make up promo materials that I have never gotten to do as part of a day job. It’s the ultimate student project for me, and has helped save my creative sanity. The major attraction to me is that I’m generating a real, physical object that is durable, and semi-permanent – which is the one thing I miss about designing purely digital goods for so long. If you put the wrong name or phone number on a business card, you screwed up and you’re going to be reprinting the entire batch. It’s not as easy as pressing a couple buttons. Imagine you’ve designed the new Cheerios box – and millions of boxes in, an error is found. Oops. You just killed a bunch of trees for nothing and you’re responsible for a huge product recall. Even worse, consider what architects and engineers go through. Discover a roof design is flawed after a building is finished? Or that your structure can’t sustain wind gusts? Or that you ended up building in a completely unsuitable location? If you’re Ghery, or IM Pei, or Frank Lloyd Wright, you’re fine and will be celebrated as a genius, not bound by the laws of nature. Everyone else, you’re screwed. Digital, thus far, is ephemeral in any way imaginable, from the work we produce to how we store our work. I mentioned before how there’s no such thing as beta. What if we applied to digital work as well? What if changing a CSS file or fixing a typo cost as least as much effort as, say, having to knock a hole in the drywall in your house. What if updating a page template were as physically inconvenient as renovating a kitchen. We’ve taken it for granted that we can update quickly and that, even if we can’t, customers will rush out to buy the next version. And if we do make something long-lasting, we still have trouble archiving it for more than a year or two. 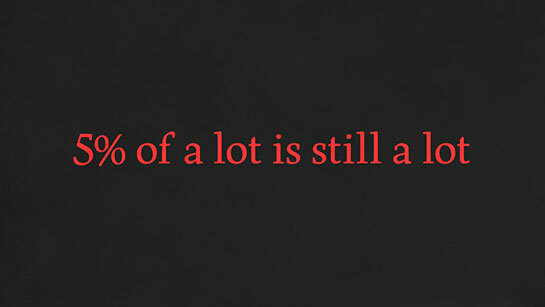 It’s still mostly about the next big thing, and less about making something lasting. Let’s strive to make it permanent. I am bad at this.